NCR has launched NCR Express Key, a hotel check-in kiosk that lets guests who have checked in online or via a mobile phone collect their room key without queuing at reception. The kiosk allows guests to identify themselves by scanning a printed or mobile-delivered reservation confirmation barcode, via mobile acoustic keys or with an NFC mobile phone. 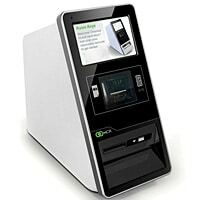 “The low-profile kiosk can be placed on counters or table tops throughout a hotel, in elevator lobbies and other convenient locations, giving more options to guests who have lost their keys, left keys in their rooms or arrive at their rooms to find that keys will not work,” says NCR.